When presented with a problem I like to find a simple, inexpensive and effective, often novel or innovative, solution. The zone is the area that the robotic lawnmower stays within when cutting the lawn. 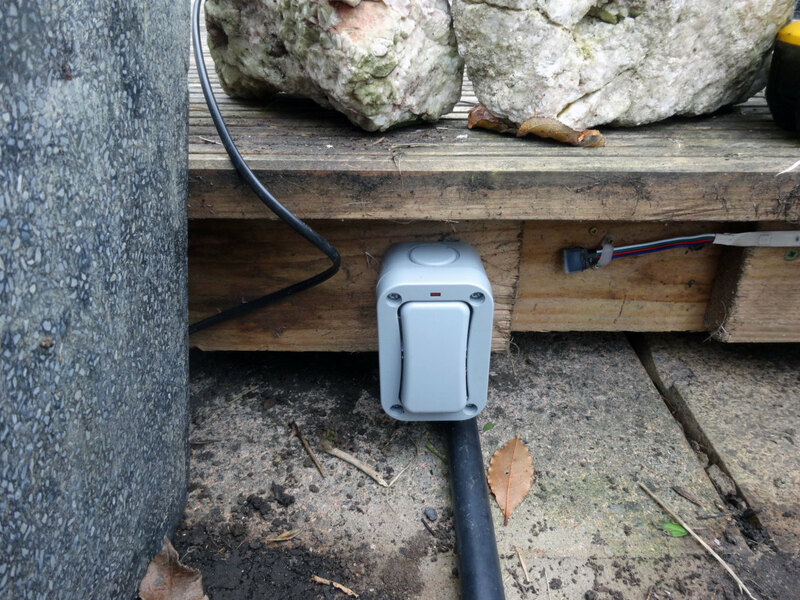 Before using a robotic lawnmower you need to lay a low voltage electrical cable around the perimeter of the lawn to stop the lawnmower from straying, and to give it a guide back to the charging dock. When it needs recharging it follows the boundary wire, in the direction of the current, back to the charging station. Dig a shallow trench to bury the wire. I prefer the former, because years ago we had the privilege of a week free trial of a Husqvarna robotic lawnmower for a local newspaper review, and in that shot time the boundary wire I laid around the lawn quickly started to bury itself. So I don’t see any point in going through all the bother of digging a shallow trench when nature is going to do the job for you. You can’t give the robotic lawnmower acute angles to follow or expect it to make sharp turns. 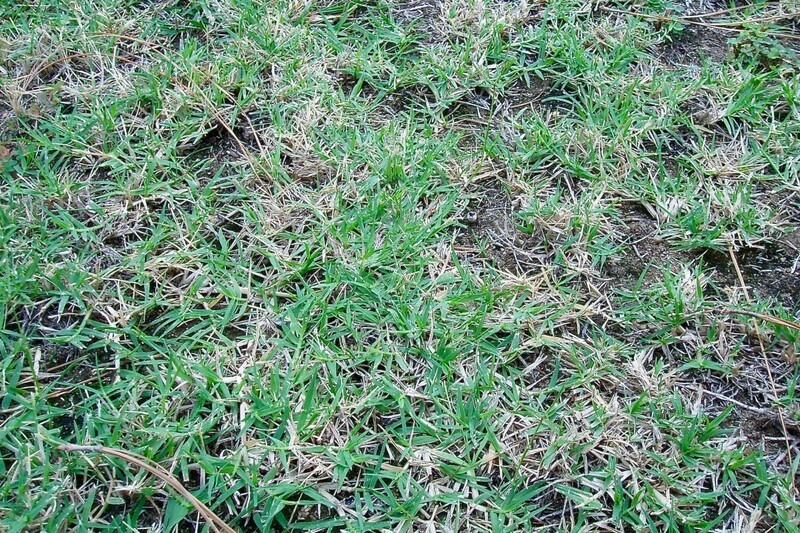 Therefore in the corner of the lawn the wire should be pegged down as gentle bends rather than a sharp 90 degree turn. The lawnmower can’t manoeuvre in small gaps less than 1m (3 feet) wide. Where there are high barriers along the edge of the lawn, such as hedges, walls and fences, then the boundary wire should be laid far enough from them to give the lawnmower some clearance to avoid the risk of bumping into them and getting stuck when following the boundary wire. Therefore, you still need to periodically tidy these edges with a strimmer, which is a lot easier than mowing the whole lawn. 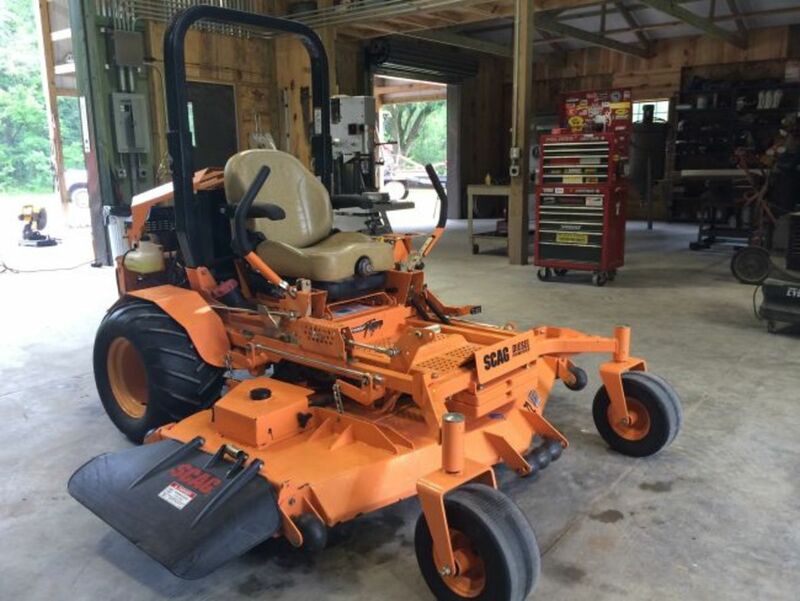 The lawnmower needs to be kept away from small obstacles of just a few inches high, such as raised lawn edging, to avoid its cutting blades hitting them; although if the path or patio is level with the lawn, then there is no problem. 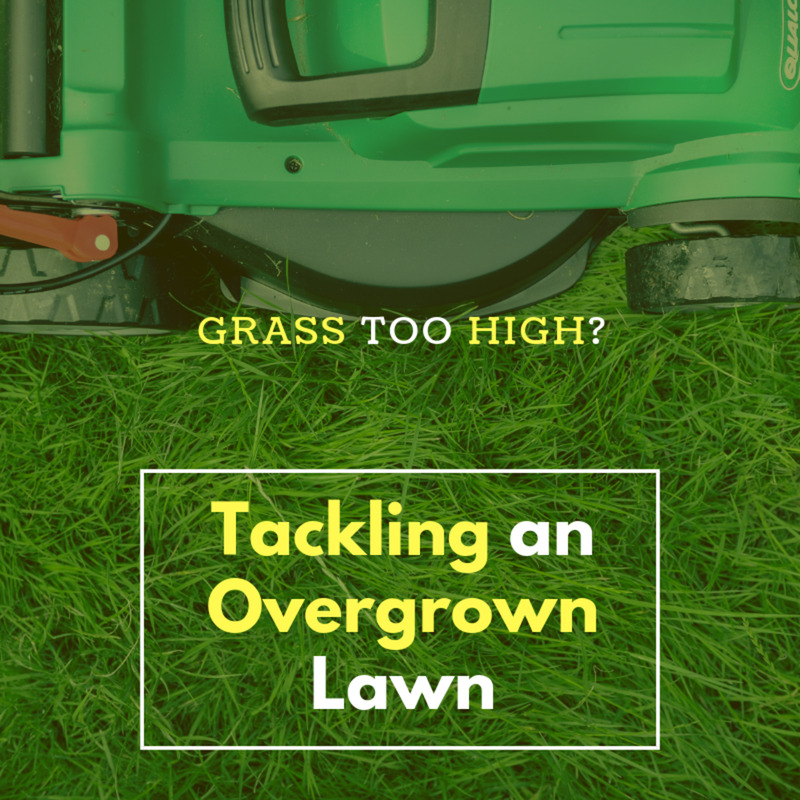 The lawn should be reasonably flat and level so that the lawnmower isn’t going to slip down steep slopes or get stuck in holes. 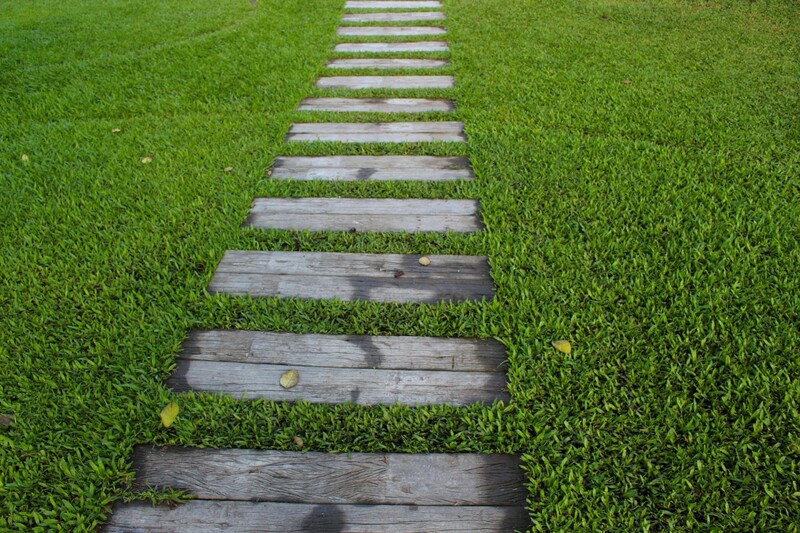 Obstacles in the lawn, such as a whirligig washing line or tree isn’t a problem as the lawnmower will just change direction when it bumps into them. However, the biggest problem for me is that we have Spring bulbs planted under the miniature fruits trees in our mini-orchard at the bottom end of the lawn, and I don’t want the robotic lawnmower trampling all over the bulbs and cutting off their leaves and flowers during the spring and early summer. 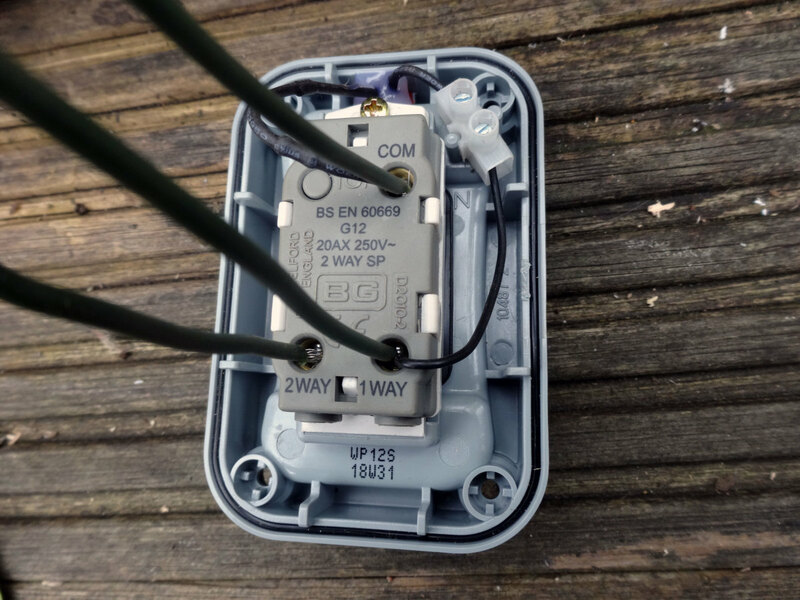 Therefore, my desire to multi-zone the lawn, which isn’t an option if you wire the boundary wire to the charging station in accordance with the manufactures instructions. 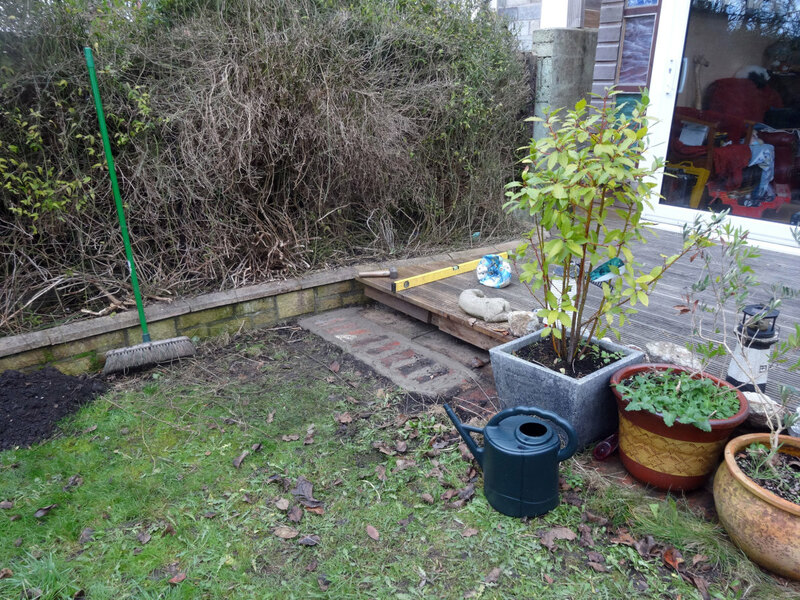 As the lawnmower can't get into tight spaces, laying bricks in small gap in front of decking before laying the boundary wire. 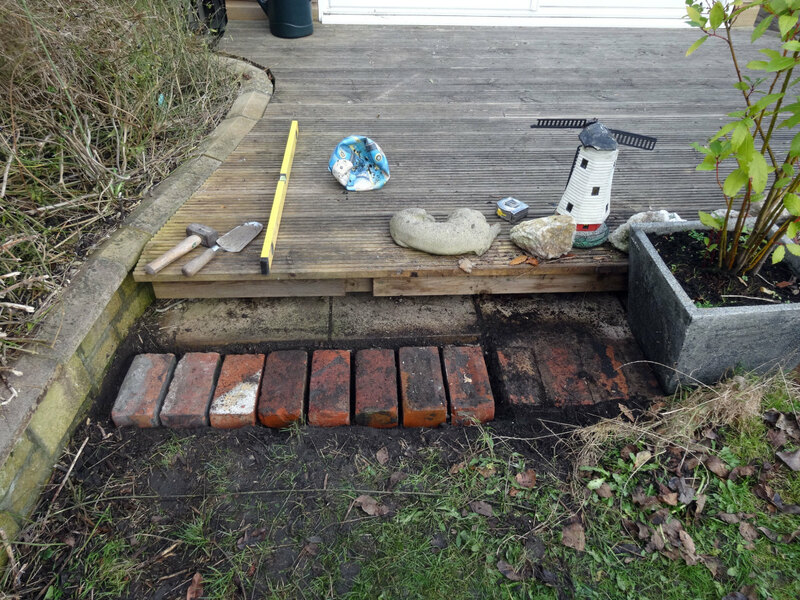 Bricks set into the lawn and cemented down. 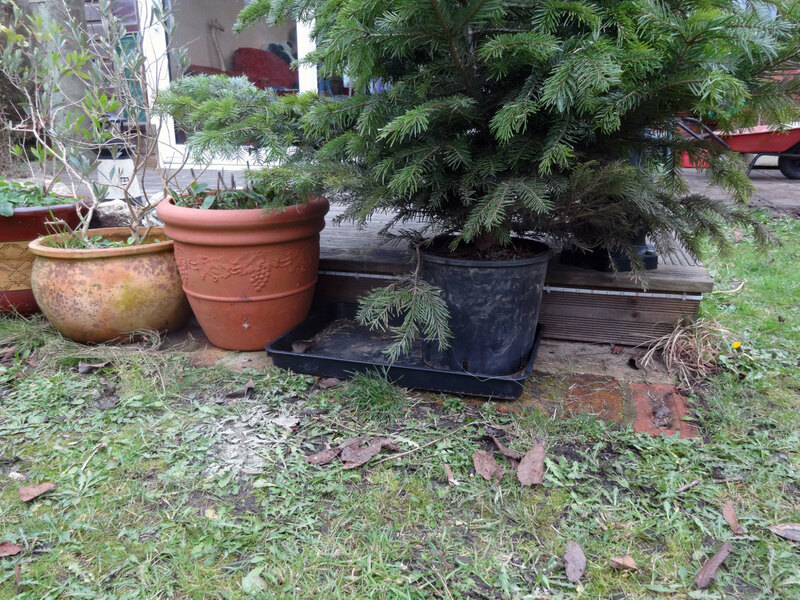 Also, to avoid risk of the blades from hitting the water tray of our Christmas tree, a need to protect it with a higher barrier. 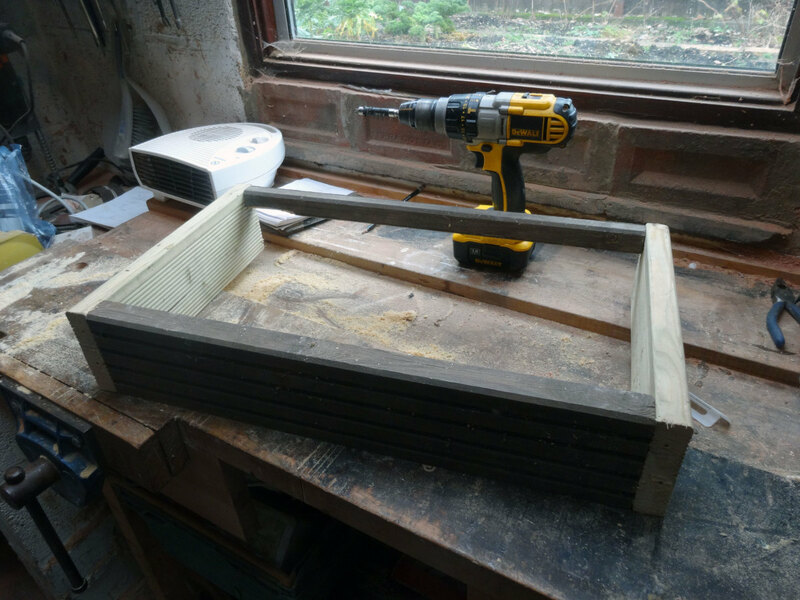 Cutting pieces of decking to length to make a simple box to fit over the Christmas tree water try as a protective barrier from the cutting blades of the lawnmower. 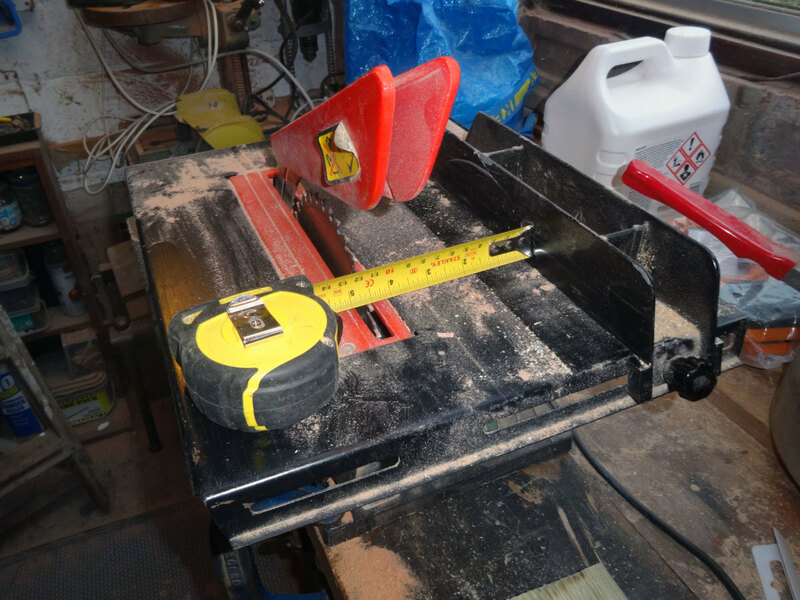 Cutting the decking to the required width. Screwing the pieces of decking together to make the boxed frame. 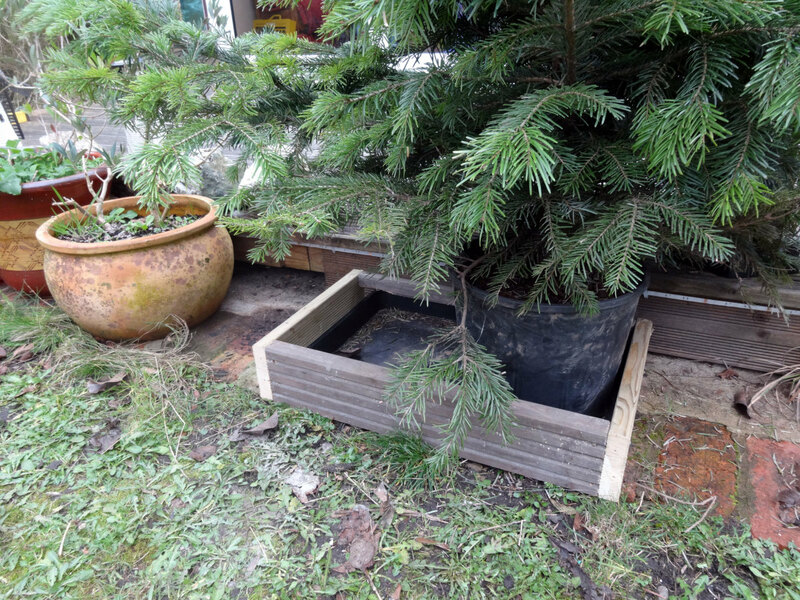 Boxed frame placed over Christmas tree water tray for protection. 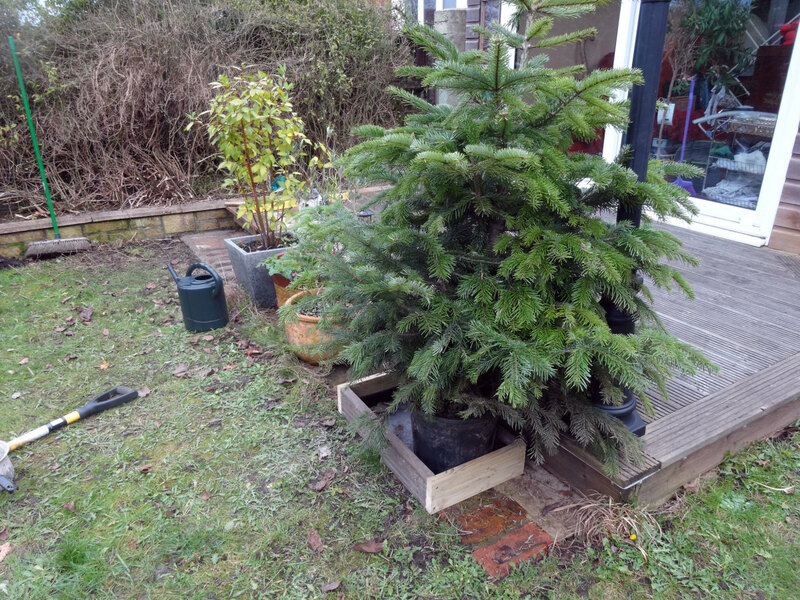 Christmas tree in front of the decking with water tray protected by a simple boxed frame, from potential damage by the lawnmower's blades. 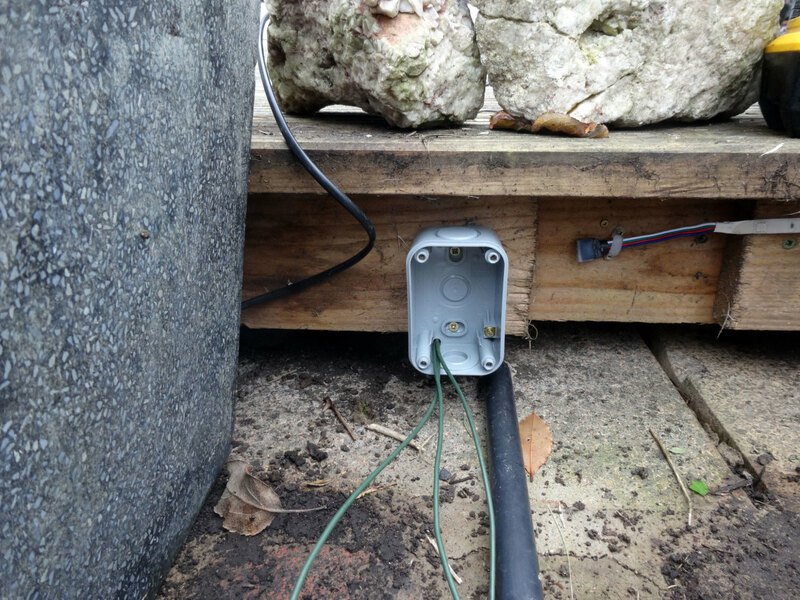 Laying the mains power cable under the decking for the charging base; lifted a decking up at the far end, and tied the plug to the end of a cane, and pushed it under the decking to the far end. 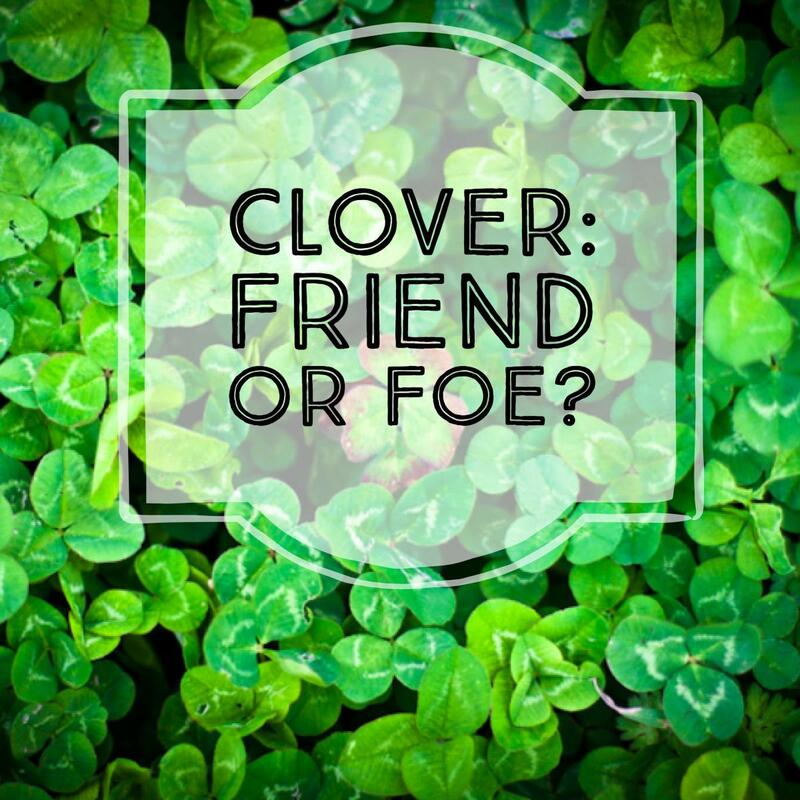 Having the whole lawn as a single zone isn’t a problem for most people, even with flowerbeds in the middle of the lawn. 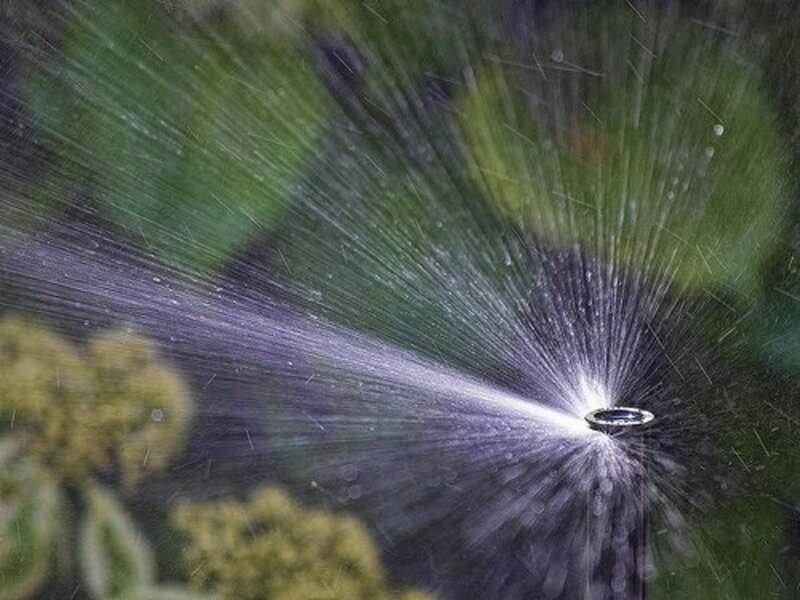 To zone around a flowerbed in the middle of the lawn you simple lay the boundary wire from the edge of the lawn to the flowerbed, around the flowerbed, and then back to the edge of the lawn. 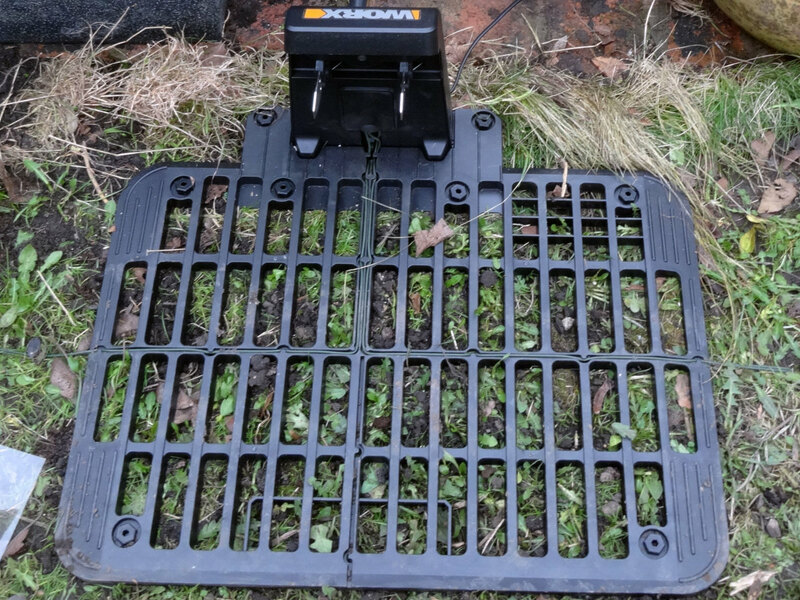 If like me, you have part of the lawn planted with spring bulbs, the last thing you want is the robotic lawnmower munching on your daffodils in the spring; therefore my desire to multi-zone. The limitation preventing multi-zoning is the boundary wire is an electrical circuit with one live and one neutral terminal at the charging station, so there is no option for a second (alternative) circuit. Although some of the high end Models resolve this problem by allowing you to use an apt on a smart phone to teach your robotic lawnmower different zones, and then program it on when to use which zone. However, apart from not having a smart phone, as we are one of the few people still using the old mobile phones that only does phone calls and text messages, I have no desire to fork out £1,000 ($1,500) for a fancy robotic lawnmower (just to multi-zone) when a cheaper Model for half the price does a perfectly good job in all other respects. 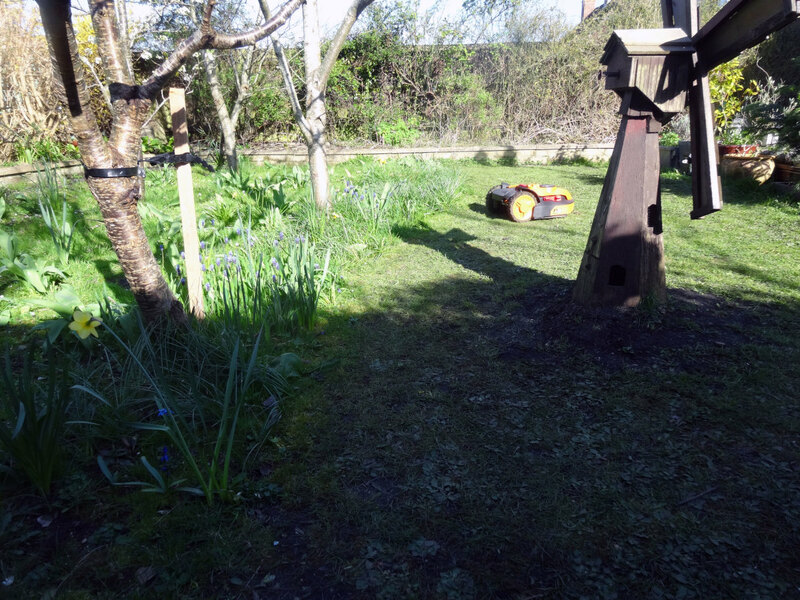 Our lawn with the mini-orchard and spring bulbs at the far end. Zone #1 to the right, and zone #2 (with the spring bulbs) to the left. If money was no object, my first choice would have been a Husqvarna Robotic Lawnmower. It’s the lawnmower we had the privilege of free trialling many years ago for a review article in the local newspaper; and we loved it. However, we didn’t buy one at the time because it was too expensive for us, and for such a small lawn as ours, we can’t justify it. 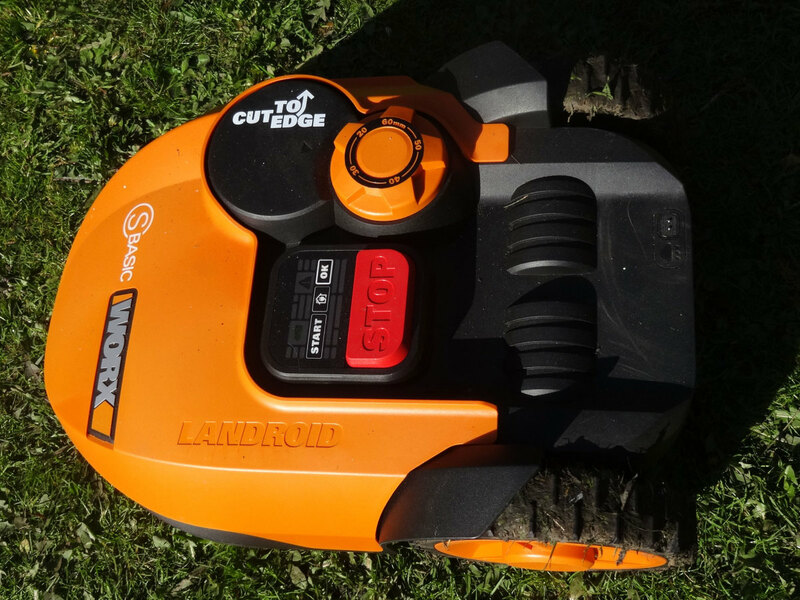 It was only last year that we noticed there are now several manufacturers offering quite respectable Robotic Lawnmowers for half the price of a good Husqvarna Robotic Lawnmower. 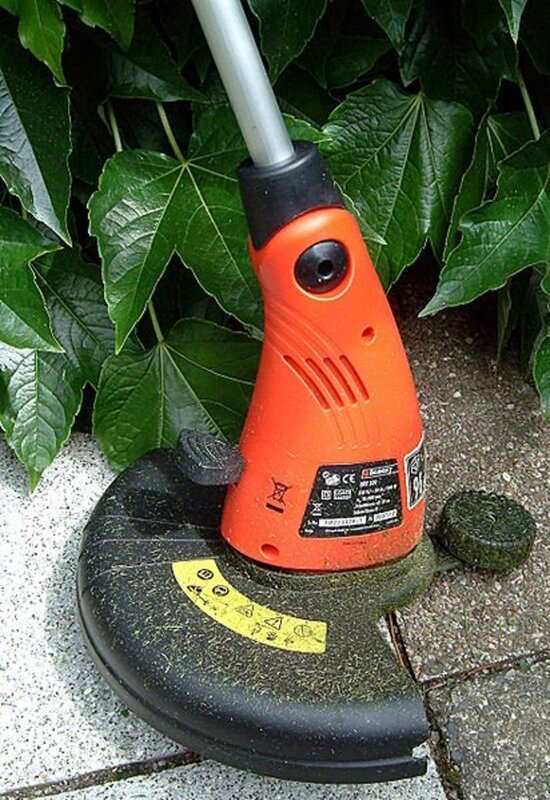 The cutting blades are off-set to one side, so that the Robotic Lawnmower cuts close to the boundary edge of the lawn, albeit you still need to periodically use a strimmer to tidy up the edges; but a minor job compared to regularly cutting the whole lawn once or twice a week. 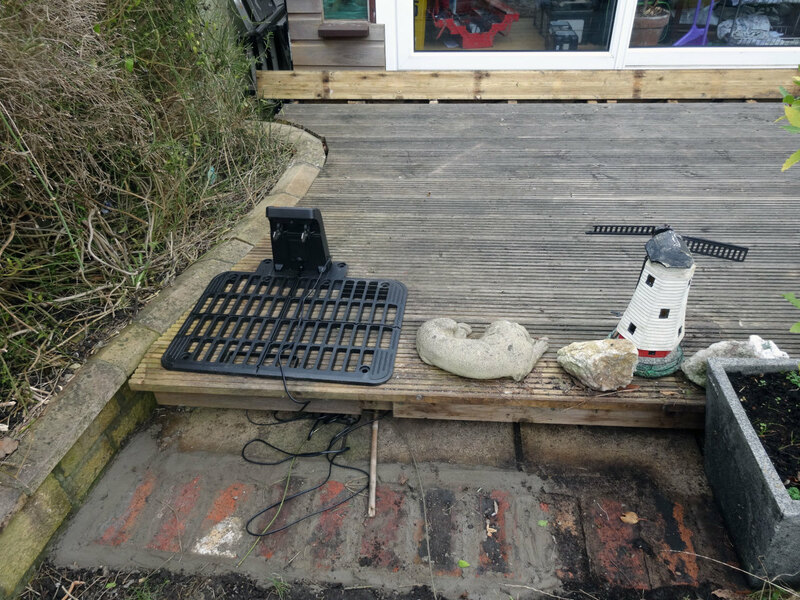 It lawnmower has a rain sensor, so it only cuts the lawn when it’s not raining; which in a wet climate like Britain is an important factor. 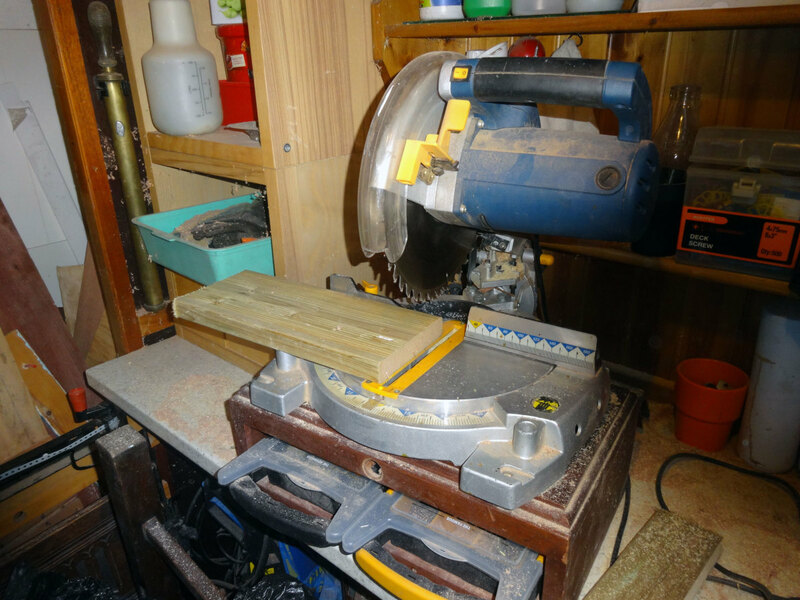 Plus, having bought other power tools from Worx I know from personal experience that they are a good manufacturer, who make good reliable and durable tools. 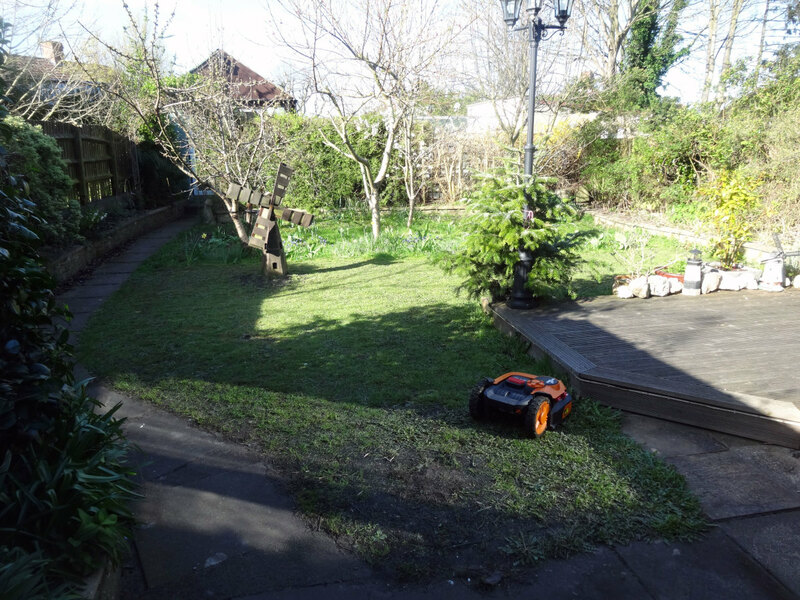 Do you own or would you buy a robotic lawnmower? Yes I own a robotic lawnmower. I intend to buy one in the foreseeable future. I would like to buy one but they are too expensive. I will not be buying a robotic lawnmower as I think they are a waste of time and money. I do not have a lawn. I would like one as a pet to watch while I relax on my decking in the sun enjoying a cool drink. 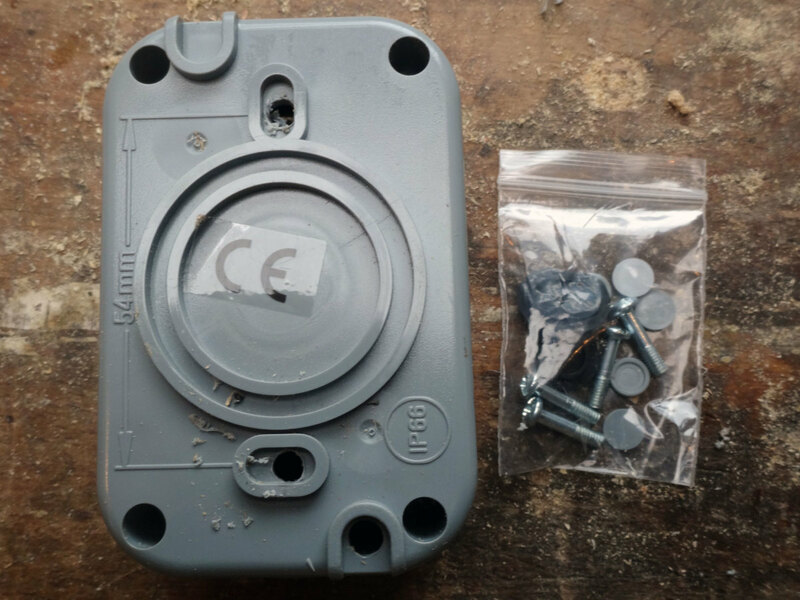 My solution for multi-zoning a lawn for a robotic lawnmower is simple in principle, relatively easy and quick to do in practice, and inexpensive. 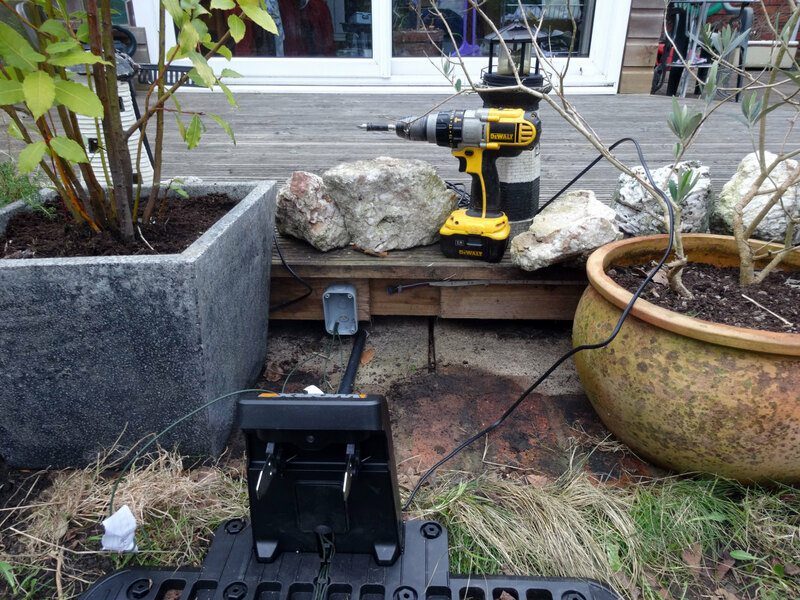 Feeding the live cable from the charging base into the COM terminal of an exterior (weatherproof) 2-way switch, with one circuit wired into L1 and the other circuit wired to L2 in the switch. Then laying the boundary wire for both circuits where you want them, and feeding them back into the Neutral terminal in the charging base. 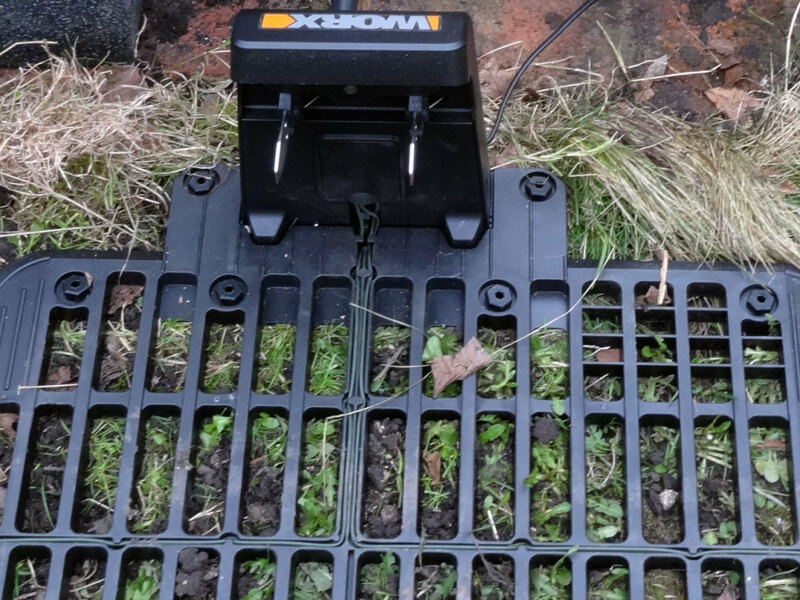 Drill a small 5mm (1/4 inch) hole through the drain hole at the base of the back box; which is just big enough to squeeze the three wires through for wiring up the two circuits to the charging base, for mulita-zoning the lawn. Pre drill the two holes for mounting the switch under the decking, behind the charging base. Boundary wires pushed into the channels in the base of the charging station. Boundary wire from the live terminal fed behind charging base to the switch, with the two wires returning from the switch pushed into the channel in the base of the charging station; along with the return cables to complete the circuits. Wires fed to the switch in a protective conduit. 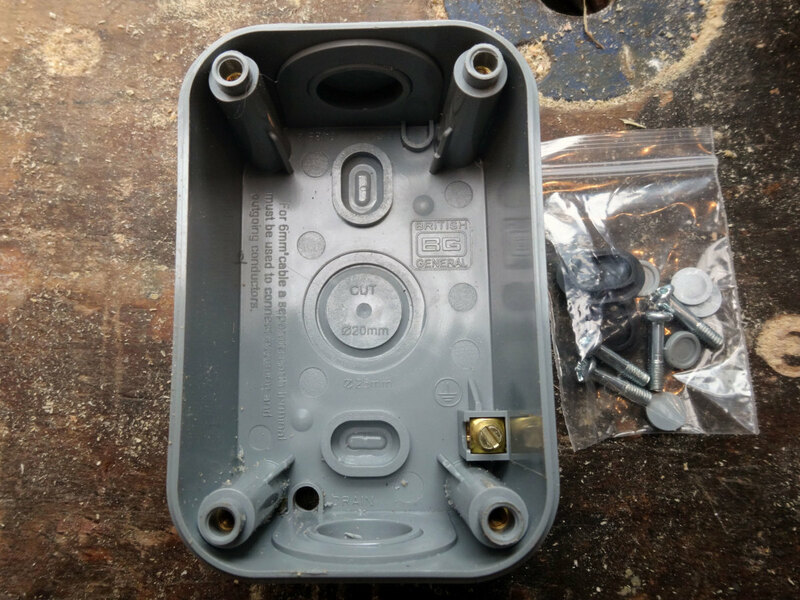 Wires fed through the drainage hole in the switch back box, ready for wiring the 2-way switch. Live wire in the COM terminal, and the wires for the two circuits, to create the two zones, wired into L1 and L2 respectively. When switch is in up position zone 1 is a live circuit, and when in the down position, zone 2 is live circuit. 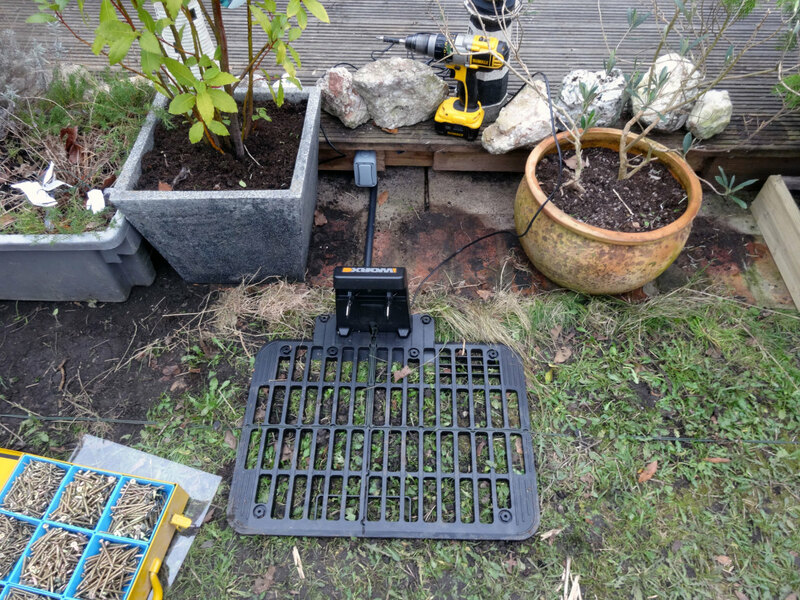 Robotic lawnmower charging base, with 2-way switch for switching between the two zones behind it (fixed under the decking front). It's good to learn something new. I didn't even know that this was a thing!